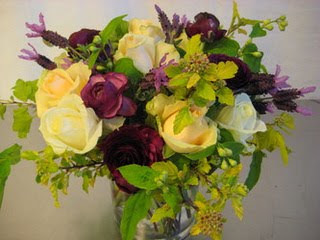 Order flowers from Dragonfly Floral Healdsburg and take her breath away with fresh, unconventional flower arrangements. Crafted with love and care by a mother-daughter team on an organic flower farm, Dragonfly Floral's arrangements are the perfect gift for mom! 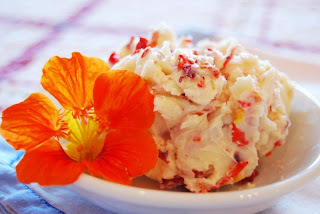 Call 707.433.3739 to place your order or use Dragonfly's on-line order form. Orders placed before April 30th will be given a 10% discount. 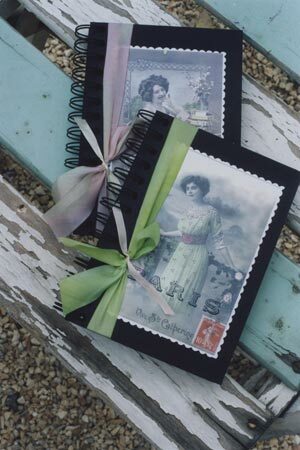 Please place your Mother's Day orders by May 5, 2010. The Feathered Nest in Novato, invites you to the third “Barn Sale” on May 1, 2010. “Part flea market, part craft show and all fun” - and just in time for Mother's Day gift shopping - this event offers families a fun day of treasure hunting and experiencing the fantastic work of local artisans. Featured artists include Christy Silacci, Juliet Kelly, and Anna Corba (who have all been featured in Somerset Studios. Michelle McCauley, owner of Summer Cottage Antiques in Petaluma, was featured in Country Living magazine and voted the best antique store in Petaluma for 3 years. More details here. 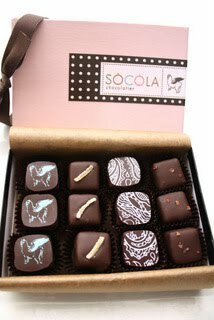 Socola Chocolates are the creative work of two sisters, Susan and Wendy, who are graduates of Santa Rosa's Maria Carillo High School. Starting off with truffle sales at the Santa Rosa's Farmer's Markets, these girls are now one of the hottest chocolatier boutiques. Even Chef Morimoto has given these handmade, locally sourced, uniquely flavored chocolates a thumbs up! The Mother's Day selection includes flavors such as: Jasmine Tea, Pretty in Pear, Yuzu Ginger, and Burnt Baby Burnt in the Delicate Dozen, a 12-piece Assortment, you can place an order by clicking here. Order by May 5, 2010 to ensure delivery by Mother's Day. A dear little seed lay fast asleep. Wake! sang the birds taking morning flight. What a wonderful world outside to be." You can be a part of Sono-Ma in almost any way you please. Sign up for our Newsletter service and you'll be sure to get all article posts and local updates. 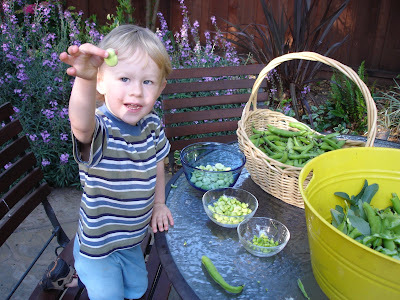 Sono-Ma finds gardening to be a wonderfully fulfilling, and healthy family activity. Get your kids outside and plant a "kitchen garden" or garden that brings food from your own tiny farm to your family table. These organic, hand collected cilantro seeds can be planted today. Set aside some family time to tend to your new plants, and in just a few weeks you'll harvest your reward! Local gardeners from "A Sonoma Garden" share the many useful properties of cilantro here. This Sonoma family says cilantro is a mainstay of their cooler season garden (aka Spring and Fall), and shares how to keep your supply going by re-planting your seeds every few weeks. In warmer weather, your cilantro plant will "bolt" or develop flowers and then seeds (shown in A Sonoma Garden's photo above.) 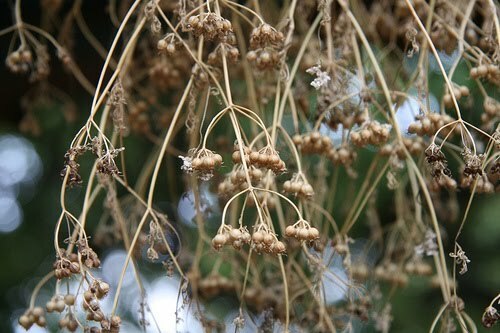 These seedpods are often called coriander - a key ingredient ground in many Indian curries. Carrie Grosvenor of How To Do Things.com also provides great details for "How To Grow and Harvest Cilantro." She suggests planting your seeds a few inches apart and about 1/4 inch deep. Choose an area that gets both sun and shade, and try keeping the soil moist with a layer of mulch. Wait about 8 weeks, and your plants should be ready for harvest! 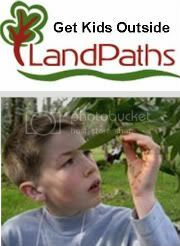 Select outer leaves first, and you may get as many as three harvests. 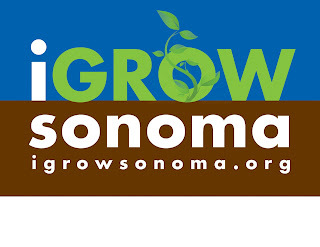 For more ideas and gardening tips, see Sonoma County's igrow site. Just where did Sono-Ma come from? Let's just say that the seed of the idea was planted when I first became a mother, and I began to see Sonoma County through the new lens of a parent. While I'd moved to Sonoma County in 1995, I blamed that fact on chance and circumstance, and planned to find another home where I would settle down to perhaps raise a family. However, I started to develop a fondness for the place where I built trails in dozens of gorgeous green spaces with the teens from the Youth Volunteer Corps. I found a growing respect for the many innovative and civic minded folk who worked with me to create healthy communities through my job at the Health Department. Then we bought a house in downtown Santa Rosa, and I found I could live my whole life without driving a car. I walked to the Farmer's Market, the library, my doctors' offices, and the happening fourth street. Later, I signed up for Business School and found I could easily commute to Market Street in San Francisco to get a first rate education while enjoying the city life in weekly, bite sized durations. It hit me... I live in the center of the best place on earth! As we all say, Sonoma County is a gorgeous green space, is home to local innovators and artisans, sports a lovely coastline, and is a hop, skip, and jump from the world class metropolitan city of San Francisco. 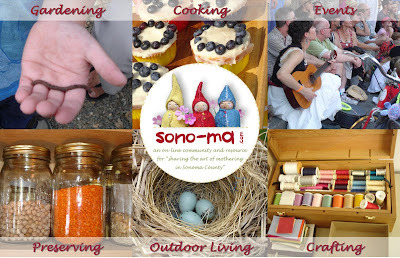 Sono-Ma began to grow in my mind as I saw this new way of parenting by living local, being earth-centered, living on a rhythm around the core elements of hearth and home, and nourishing families' bodies and souls... I wanted to capture and document this growing "Sono-Ma style" mothering movement, and provide resources to local moms who were also hungry for support in creating a this grounded, healthy way of raising families. This wonderful collection will have the whole family singing along or smiling. 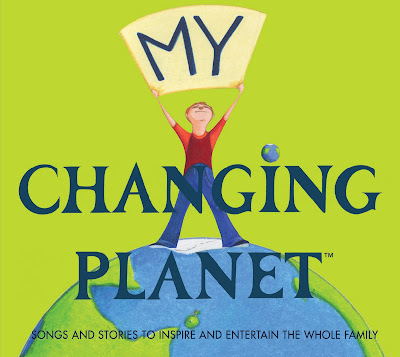 “My Changing Planet” combines the passion of four creative mothers, popular singer song writers, and earth education delivered in a highly appealing and entertaining format. Read more about the local moms who developed this CD here. One subscription member will be randomly selected to win a copy of this CD on Sunday, May 25, 2009. I attended my first birth blessing two years ago, and was deeply touched by the beauty, ritual, and connection this event inspired. In one afternoon, our mothers' (and toddlers') group moved from friends to sisters, as our wonderful facilitator brought us together in a ceremonial celebration of motherhood and birth. 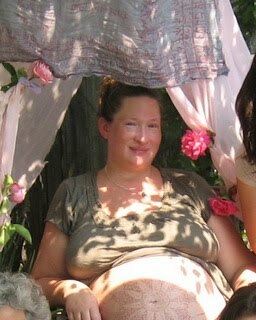 Our experience began with making a sacred space for the mother to be, Karla Gormley. We created a lovely "throne" for her with a billowing pink canopy hanging above her chair. Taking special care to make her sitting space both lovely and comfy, we tucked roses into the folds of the canopy and put soft cushions in her chair. Next, our facilitator had us gather in a circle around Karla. She called each of us forward to choose items from her basket to add to a bowl, which would soon be filled with hot water from a kettle to make a warm foot bath. We selected items such as tiny pink rosebuds, lavender buds, raspberry leaves and essential oils and added them to the bowl as we also added in our positive intentions for her pending birth. An older child helped to pour the water, and we all watched as the herbs steeped into a healing brew. Karla carefully lowered her weary feet into the soothing bath, letting loose a tremendous sigh. She confessed it was the first time she'd relaxed, rested her feet, and focused on her the immediate coming of her second child. Later, we took turns washing Karla's feet and massaging her hands with soothing oils. As we moved in to physically offer our support, we took turns verbalizing a blessing or affirmation for Karla and her spirit. "Remember the healing power of laughter and humor..." "Ask for help and we will come..."
We knew she faced a great challenge with giving birth, and then returning home to parent two small children. Inspired by the connection created by the ceremony and Karla's vulnerability, we promised to serve as her sisters in motherhood and to help her through the challenges. Everyone was wiping away tears by the time the last blessing was offered. To lighten our spirits, we then feasted on treats the mothers brought to share and watched as Karla opened a few gifts. I left thinking, "Wow... Women have supported each other like this for centuries, but I've never been part of a ritual or stopped to ready myself for such a huge rite of passage..." I wanted more! Karla also wanted more and felt inspired to give back some of the nourishing female support she's received in various forums over the years. 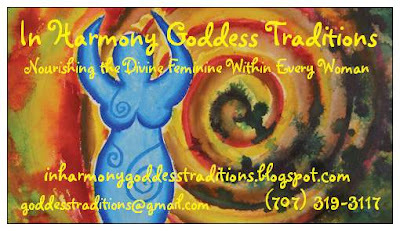 This mom-preneur took her vision and created a business service to do just this with: "In Harmony Goddess Traditions". 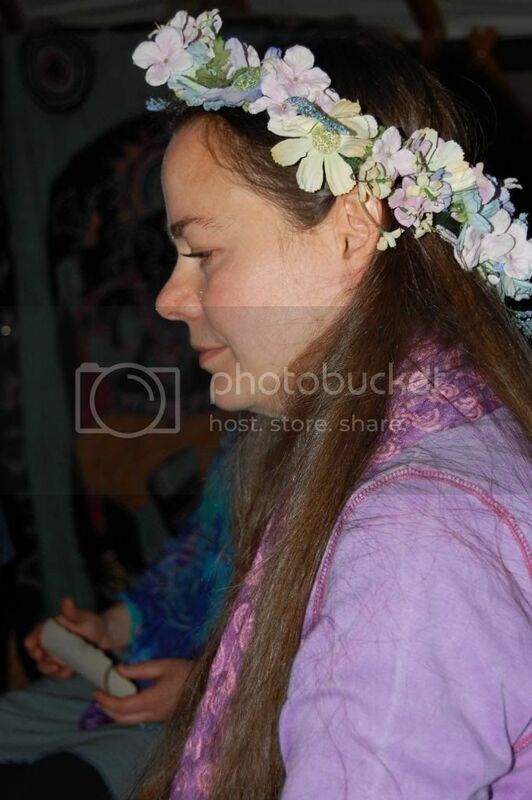 Building on her massage therapist skills and partnering with friend, Jo-alle, who is an herbalist, Karla created a party provider service to help plan, organize, and facilitate events designed to bring nature, sisterhood, and ritual back into our lives. In Harmony offered its first party last Saturday, engaging a group of women in a fun, affirming, "women's night out." I ventured out to the hills of Napa for this party - my first time to seek out another ritualistic experience since Karla's blessing two years ago. I walked into a candle lit yurt and smiled at several other women who were strangers to me. Although I am shy, I found myself quickly relaxing. The room was covered in flowers, silks, and candles and soft chimes played in the background. Jo-alle and Karla met each of us with warmth and smiles, and set an easy tone for the evening. Our ritual then began with what Karla and Jo-alle called "adornment." We took colorful sarongs and flower head wreaths and helped each other drape on the lovely accessories. We giggled while Jo-alle reminded us that women have been helping to make each other feel beautiful for thousands of years. We stood up a little straighter and felt a little sassier as we recalled that age old power of women to be beguiling. Then we laughed some more as Karla doused us in glitter. 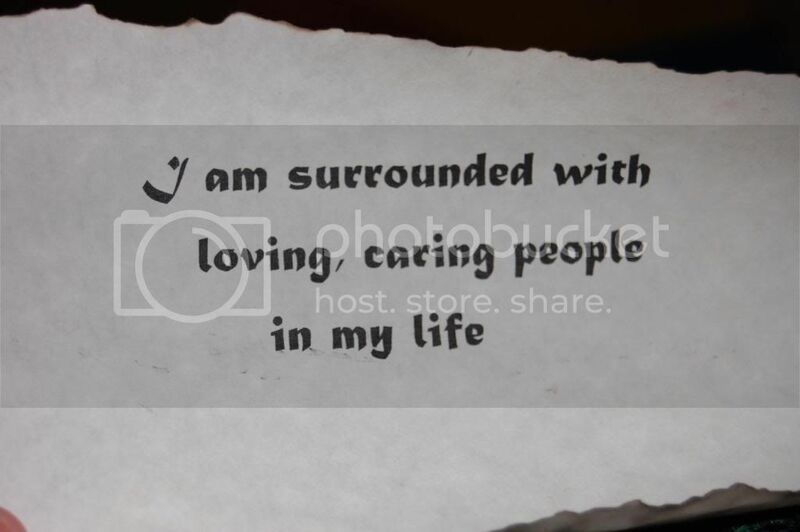 Feeling lovely and positive, we then took a quiet moment to draw a paper scroll with an affirmation from a lovely bowl. Each woman read her selected affirmation aloud, pausing to reflect on its meaning and to share a bit about our current lives. Again, I felt drawn to these women who were able to be deep and personal. It's not everyday I get to be vulnerable with other people, but I think I need more often! Later, we sang songs, including my personal favorite - an old Celtic tune "Deep Peace". While we joined our voices, Karla and Jo-alle moved around the circle and gave us hand massages. 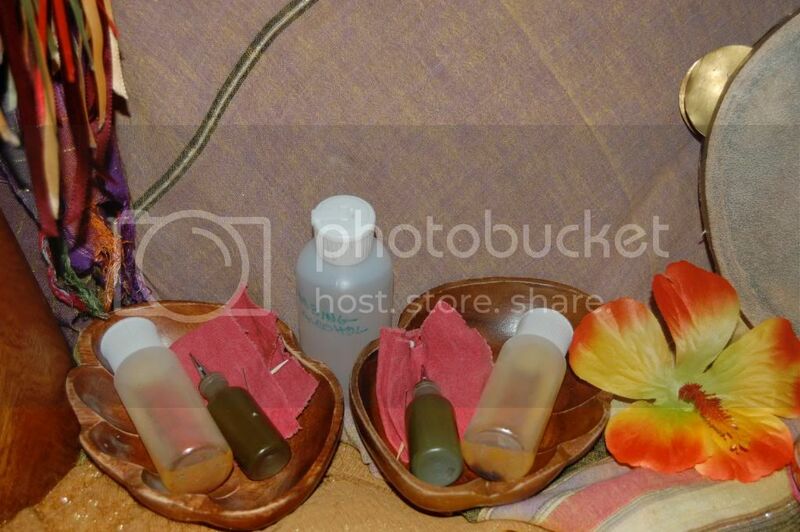 The massage oil had rose and vanilla essences, and smelled wonderful. I closed my eyes and tried to savor the small massage on my hands - these mama hands are usually busy providing nurturing for others! The ladies chatted easily, sharing stories that came to mind about woman's issues. One woman talked about how she read an entire novel earlier that day: The Blood of Flowers . She connected the characters in the book to the woman in the room as she talked about the way women used to use candles, fragrances, and adornment as part of creating a personal inner power and beauty. As Karla and Jo-alle then worked to draw henna symbols on our hands, this woman spoke of how the Iranian women in the Blood of Flowers also used henna to decorate their bodies in preparation for their wedding nights. 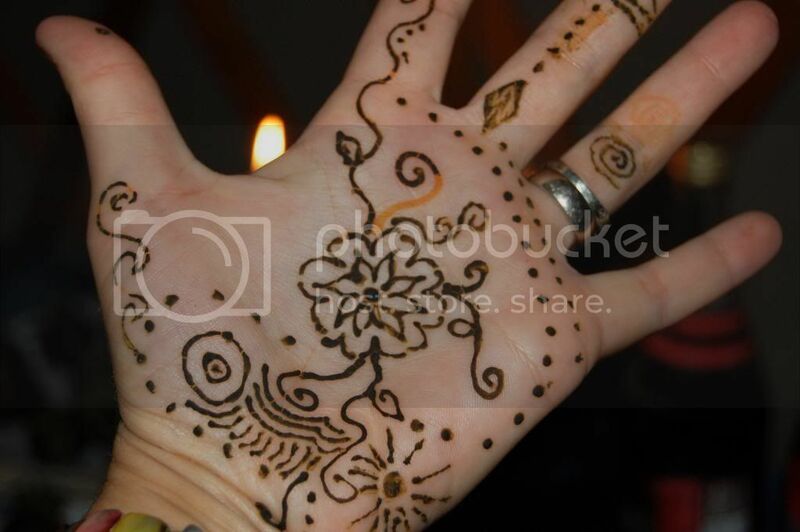 Others chimed in with stories of other cultures using henna as we each received our own temporary tattoos. We ended the evening with "light feasting" on decadent cheeses and desserts. 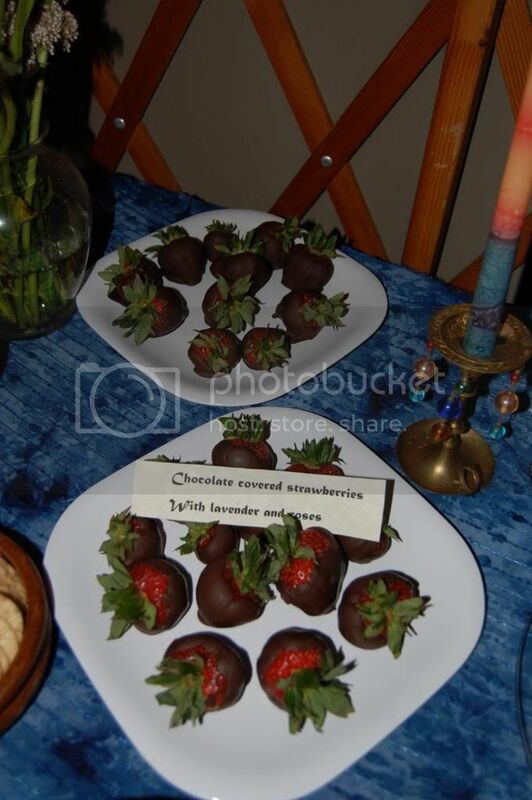 Jo-alle brought strawberries dipped in Belgian dark chocolate (sold in bulk at Trader Joes!) infused with ground lavender and rose petals, which everyone heartily devoured. We felt indulgent and sated as we ended the evening by chatting. Again, I found myself wanting more! I'm not sure when I will next call upon Karla, Jo-alle and In Harmony to help me feel nourished, but I am sure a future birthday, women's night, or other opportunity will come. When it does, I'll call In Harmony to help me connect with my circle of women and support my own divine feminine! Sound your air horns and grab your lawn chairs, families. Parade season just started in Sonoma County! While I've never missed an opportunity to sit on the curbside and watch a local parade, this year will mark the first time I've ever walked in a parade. No, I don't need to practice my "princess wave." But I will get to delight crowds by handing out tons of cool freebies! Sono-ma is providing seeds to help encourage families to get outside and garden (yes, we love igrow!) AND we'll be helping Whole Foods pass out samples from generous locally based vendors. Petaluma's Whole Foods Market invited Sono-Ma to participate in the Whole Foods parade unit, which will proudly march in the 29th Annual Butter and Eggs Parade this Saturday April 24, 2010. Building on the theme "Petaluma's Shining Moments", Whole Foods pulled together a community parade team to demonstrate Whole Foods shining community building efforts in Petaluma. From teaching kids about worm bins to Earth Day puppet shows and more, Whole Foods Petaluma has much to celebrate when reflecting on bringing community together. I adore the way Whole Foods Market works to be a family friendly store, and I am thrilled to join in their parade team. Bryles and I will be representing Sono-Ma - perfect since this whole gig is about being a mom and loving it! So what does a crafty mama do when preparing to be in a parade?? She gets creative about decorating a mini-float, making Sono-Ma "costumes", and creating a fun take home treasure! Pull out the wool felt, the photo transfer paper , commandeer a few underused hats, shop for a couple of white t-shirts, and you've got the makings for a ton of fun branding materials. I know Vista Print offers t-shirts and hats for pretty cheap, but mine are homemade with love! We also made some giant flowers to decorate his float (aka Radio Flyer wagon pictured above) You too can take your mom-made business and get it out there by using photo transfer paper and an iron. Next, I wanted to join in with the other Whole Foods vendors and have something to pass out to the crowd. 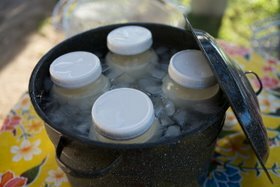 What does an eco-centered, health food lovin' mom give local families? Balloons and plastic gizmos are out, and suckers or candy are off the list.... Why not seeds? Sono-Ma's aim is to "help grow local families," so Bryles and I created 300 seed packets to gift to parade goers. We used coin envelopes and mailing labels to package our hand gathered cilantro seeds (thanks Nina Bleue!). My hope is to inspire families to go on-line to get information about starting a kitchen garden, while checking out Sono-Ma. 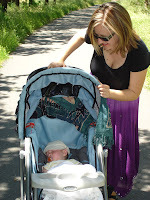 The new site is due out on May 13, and I can't wait to share this Sonoma County mom on-line resource and community. We hope to see you at the Butter and Eggs Parade! For information about this parade and all of the other fabulous community marches slated for coming weekends, please read this Sonoma County Parenting Examiner Article: "Parade season in Sonoma County showcases community, culture, and family fun at its best." Don’t you just love the way the sun and birds call you outside to the garden on Spring mornings? Last year Bryles and I spent several hours shelling and sorting Fava beans. Even my active then two year old was content to sit and shell for a long duration as the sun warmed our backs and the yellow finches darted about our garden…. 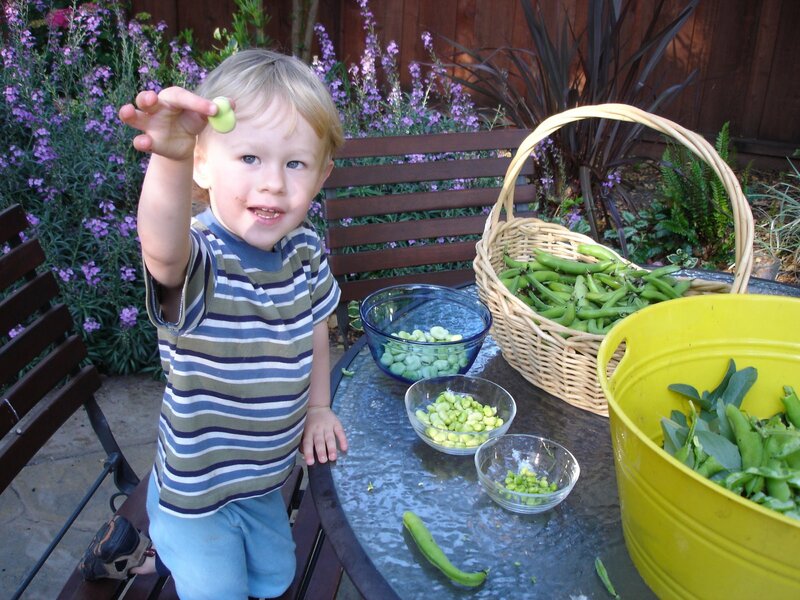 This year, we filled our garden beds with peas in the late winter. Bugs and harsh weather took their toll on our on the tender plants in those early months of the year, but the peas’ tendrils are now clinging tightly to our trellis. My neighbor, amazing do-it-yourself-woman, Sharon Eisley, is busy erecting trellises of her own creation in her yard. Using the branches she trims from her apple and other trees, she creates amazing bent wood trellises that always cause me to stop and exclaim over their beauty. Sharon started roses on this trellis, although I bet she's got peas planted at the base. This tree's base is now surrounded by a tipi style trellis with sweet peas climbing up the sides. We've had great fun hiding inside reading books and having picnics with the kids. I haven't caught Sharon on video constructing her trellises, but this short "how to" shares how to easily construct such beautiful garden made trellises. (photo shared via the generous Victoria Wesseler of Going Local) Maybe I’ll see if my raw milk friends at the Leras Family farm have some extra cream for me this week. Earth Day 2010 celebrates its 40th anniversary this year. Local innovators and artists ensure your family will find many opportunities to honor the occasion through entertainment and earth education. Renew your commitment to protecting our planet through an inspiring music and spoken word collection by famed artists, an eco-puppet theater, and local events or festivals designed to engage your family. This wonderful collection will have the whole family singing along or smiling. “My Changing Planet” combines the passion of four creative mothers, popular singer song writers, and earth education delivered in a highly appealing and entertaining format. 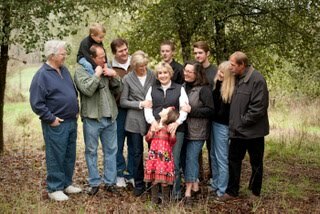 Co-creator and Santa Rosa native Heather Staples shares “My Changing Planet” changed her family. Her six year old daughter became so inspired to keep things out of the garbage, she is now making slippers out of Lego boxes. “We’re raising the next Jeremiah Tin Can!” laughs Heather. Enter to win your free copy of this CD by leaving a comment today! One comment author’s name will be randomly selected on April 17, 2010. Purchase your CD at your local Whole Foods Market beginning April 13, 2010 or download your songs here. You’ll find this album to be your family’s favorite sound track, and feel great knowing your 100% of the net profits from your purchase benefits the Nature Conservancy. 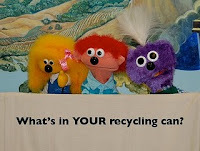 “Skip” and “Molly”, star Eco Beeps, are now delivering an earth- centered education to young audiences worldwide through video episodes and live performances. These lovable puppets carry important messages such as choosing, growing, harvesting and preparing healthy food. 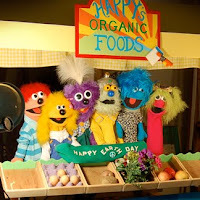 Catch a live healthy food puppet show at an upcoming Sonoma County Farmer’s market soon! Table space available for individuals and organization whose product or services contribute towards sustainable living. For more info contact Jeffrey Edelheit at jeffreyiam@aol.com. This event is a FIRST. It is about anything and everything you may need to grow your own food, buy it from a local farmer or have local food served to you. 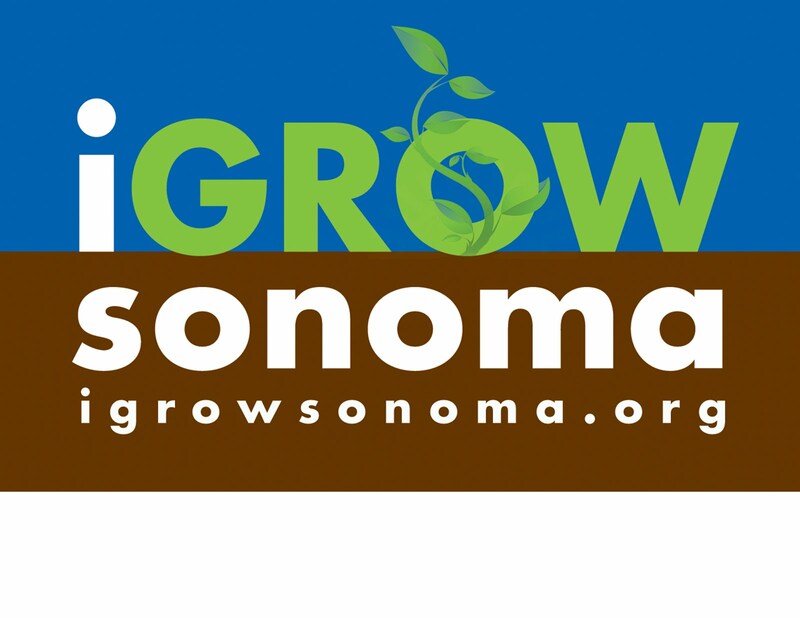 Earth Day in Roseland - 2nd Annual "Dia de La Tierra-Earth Day"
This Earth Day celebration will focus on the connectivity between climate change, carbon footprint, community health-equity, and living sustainably among the multi-ethnic communities of Sonoma County. A showcase of short films, some locally-produced, focusing on sustainability, ethics, and community in relation to how we produce our food. 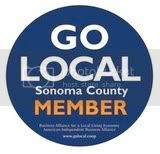 Followed by Sonoma County business and community cooperative GoLocal’s announcement of a new local food campaign. Screening at 99 Sixth Street in downtown Santa Rosa. GoLocal will be hosting the after-party for the fest.